Toronto mediation lawyer. There are many different forms of alternative dispute resolution. They are an alternative to the court system, with its high costs, long delays, and atmosphere of conflict. Mediation is usually carried out without lawyers. Both parties meet with a trained, experienced mediator, such as Toronto divorce mediator Donald Baker, and work out a solution in a fairly informal setting. The emphasis is on cooperation and finding creative solutions that will work for the entire family. We focus on needs and interests rather than procedures. A mediator can help you deal with your matter sensitively and creatively, and save you an enormous amount of time and money. More importantly, any solutions will come from you. Court-imposed arrangements are never as good as what you come up with on your own, particularly when it comes to custody and access. Mediation is also much faster than the court system. You can always find a mediator who will be available relatively soon. Collaborative divorce is a form of alternative dispute resolution in which clients try to work out their issues outside of the court system with the help of their lawyers. However, both parties must agree in advance that if they cannot resolve their issues, they will hire new lawyers before going to court. Arbitration, a sort of private court system, is not always necessarily cheaper than going to regular court. The proceedings are less casual than mediation, with lawyers and evidence being treated in a formal way, especially if complex issues of property are involved. However, it can be much faster and you generally have more control over the process. Sometimes court is unavoidable. However, at Baker & Baker, we have found that if it is possible to work outside the court system, it is almost always worth it, especially if children are involved. 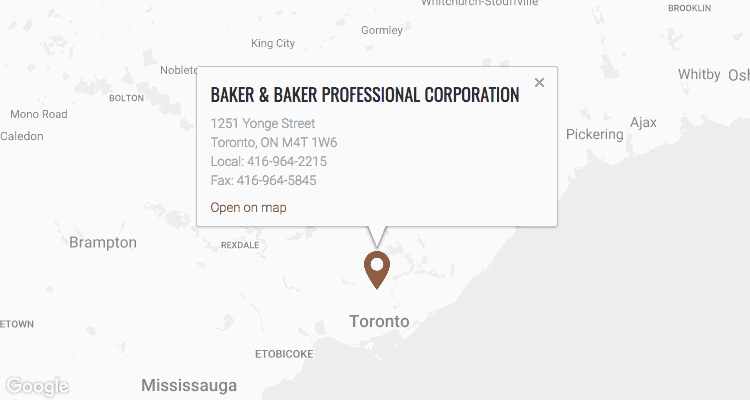 Looking for a Toronto mediation lawyer? Baker & Baker is a family firm committed to helping clients use alternative dispute resolution to find solutions that will fit their families’ needs best. Contact us at 416-964-2215 or by email to learn more about how mediation and arbitration can help you resolve your matters.